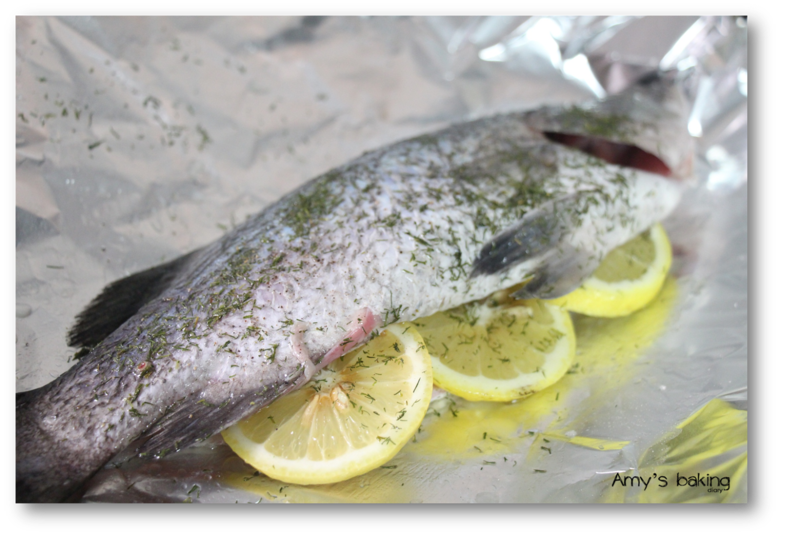 With a little lemon and dill, it makes such a simple and delicious fish! I learnt this from Yen, Eat Your Heart Out. I like the way she prepared the dishes. It’s simple and easy, which is very suitable for working mum like me. It’s always nice to have fresh herbs from your own garden. But it’s difficult or simply not possible to find fresh dill from the market in the area that I’m staying. Unusual fresh herbs like dill are usually sold in premium supermarket. I’m staying at the far end, in west side of Singapore; it’s harder for me as premium supermarket is usually located in down town, if not will be quite a distance from where I'm staying. Therefore, instead of using fresh dill, I used dry dill which also taste good too. I steam or bake most of the dishes I prepared. I hardly do deep frying because I’m not so steady in handling wok and I can’t stand the sizzling oil spilling over my hands. I prepared the dip. But instead of serving the dip separately, I poured it over the baked fish. 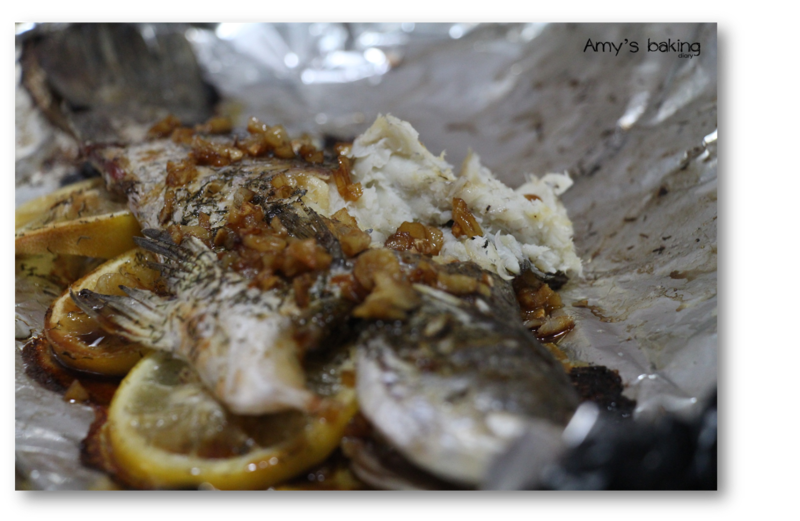 It makes the skin of the fish so moist and tasty and my family loves it so much. This recipe is definitely a keeper. At times when you're running out of idea what to cook for dinner, this will be a great choice. (1)Preheat oven to 180°C. Clean the fish thoroughly, rub some salt in the stomach area and rinse with water. Pat dry with kitchen towel. (2)Cut the lemon into half. Slice one half of the lemon into thin slices. (3)Line a baking tray with foil. Drizzle olive oil over fish, coating both sides well. Stuff the stomach area with the lemon slices and dill. Squeeze the juice of the remaining half all over the fish (including stomach area). Season with salt and pepper. (4)Place the fish in preheated oven and cook for 25-28 minutes, or until a skewer inserted in the thickest part goes all the way through. (5)While fish is cooking, make the dip. Heat the oil in a wok/frying pan over medium high heat then add the garlic and cook for 1-2 minutes until lightly browned. Remove, along with oil into a small bowl. Add the light soy sauce and mix. (6)Serve the fish hot with the soy sauce dip or pour the dip over the baked fish. 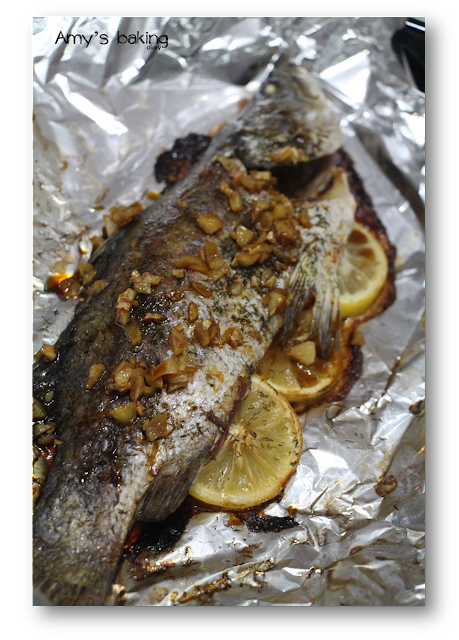 I seldom cook fish too because my boys are not fish lovers and I hate to fry it, makes the whole kitchen smell so fishy! Like the idea of baking it instead, next time I will try it too! This looks like a delicious dinner. Oh wow this looks fantastic! I can't believe I have never made anything with fish before! Yum!